Have a child that’s struggling to pick up certain concepts in school? Introducing learning during play can be just the breakthrough you need! I’ll show you how to teach STEM concepts with toys using our new Easy Stikz suction toys! Be honest, how many of the toys in your house are doing nothing more than taking up space? You know the ones I mean. They’ve either failed to live up to your child’s expectations or they just aren’t fun anymore—there’s nothing challenging about them. Now what if I told you Easy Stikz Suction Toys would never be one of those toys? 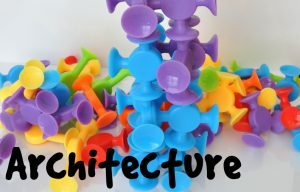 Your children will never get tired of these fun, colorful, sticky, multi-functional toys. Don’t let the sticky part scare you, though. Easy Stkiz are made of BPA-free silicone that sticks to most surfaces including wood, plastic, glass, ceramic tile, and most metal surfaces (appliance fronts, cookie sheets, etc.) without leaving any residue and tell-tale signs of having been there. The best part of all, however, is that Easy Stikz Suction Toys make learning a blast! 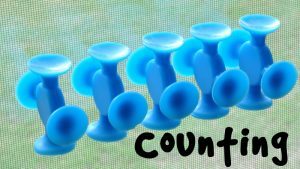 Encourage your child to count the Easy Stikz as they stick them to the side of the bathtub. Challenge your child to stick one on the front of the dishwasher or refrigerator for every member of the family, days of the week, and months of the year; counting as they go. This is a great way to interact with your child while working in the kitchen. In the car, have your child stick and Easy Stikz Suction Toy on the window for every (pick something) they see. For example: red car, white truck, sign with children on it, or their favorite fast-food place. Challenge your child to see how many Easy Stikz it takes to go from the head to the foot of their bed. Teach children to count by twos, distinguish between odd and even numbers, and measure the length of items by using Easy Stikz Suction Toys and a ruler (when necessary). The concepts of addition and subtraction are much easier for children to grasp when they can see it in black and white—or red, yellow, orange, blue, and green, and purple, in this case. Challenge your child to learn these concepts by sticking several of the toys together and asking them to remove a certain number of them and tell you how many are remaining. Do simple word problems with your child using the Easy Stikz. Example: If we put three orange and two purple Stikz together, how many do you have in all? Or, If you put ten Stikz on the window and take away your age (3, 5, etc. ), how many are left? Use a portable surface like a cookie sheet and travel through your house instructing your child to stick on Easy Stikz on the surface for every window there is in your house. Next have them add one for every door in your house and then give you the total number of Stikz they have on the surface. You can also have them count the number of houses in your neighborhood, then take one Easy Stikz away for every house that doesn’t have a dog or children. Ask them to tell you the results of this subtraction problem. This one is easy. Have your children sort the toys by color, identify which color you are holding up. Or, have your daughter make a tower out of red Easy Stikz. Challenge your child to make a particular shape out of the Easy Stikz on the side of the tub or a tray using their favorite color, your favorite color, or even their least favorite color. Physics lessons suction, force, and work (push/pull) are all lessons to be learned in using Easy Stikz Suction Toys. 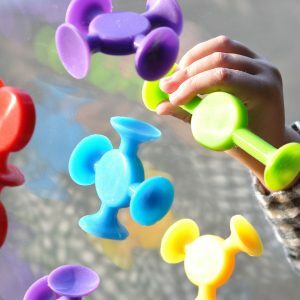 When using these toys combined with the simple explanations of the various laws of physics on ducksters.com, you and your child can have hours of learning FUN. Conduct simple experiments similar to the one suggested on the section of FINE MOTOR SKILLS. Suggestions: What surfaces won’t the toys stick to? Do they come off of some surfaces more easily than they do others? Do they stick better when they are hot, cold, or room temperature? Fine motor skills are skills we develop and master using our fingers, hands, and wrists. Fine motor skills also include eye-hand coordination. Examples: Pinching, stacking, catching, throwing, clapping, scratching, pulling, pushing, pressing, and transferring from hand to hand, hand to mouth, and hand to table. Sticking and removing Easy Stikz to each other and on various surfaces is an exercise in developing fine motor skills in your child. In addition to sticking the toys to a surface, you can use them to help your child develop strength in their hands by squeezing and releasing the toys using their whole hand OR by pinching them between their thumb and one or two fingers at a time. Ask your child to do an experiment: Is it easier to sick and remove the Easy Stikz to a wet surface or a dry one? What is the EASIEST way to remove them? Sliding them off of an edge? Lifting one side? 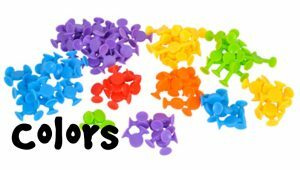 Encourage your child to make patterns with the Stikz using the various colors. Examples: Three green, one purple, two orange; one of each color, repeat; two blue, one yellow, two green. Sort the toys by shape, by shape and color. 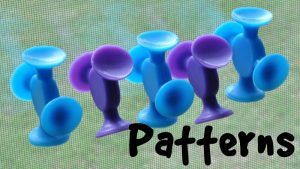 Make patterns from the different shapes; two long, one round; one of each shape; two long, one ‘L’, one round…. YOU start a pattern and challenge your child to continue it. Play the ‘what comes next’ game by asking your child what piece needs to be next to continue the pattern you’ve started. Let them do the same with you. I think by now it is obvious that the Easy Stikz Suction Toys aren’t going to be just sticking around taking up space (pun intended). These toys are going to bring hours and years of enjoyment and education into your home. Don’t you agree?